I was looking at the stamped Navajo pearl necklaces and began to wonder – How do you polish these necklaces or are you supposed to polish these necklaces? It is a matter of personal preference. If you like patina, no polishing necessary.That’s why we leave the beads in our pawn shop as is – so the buyer can decide. A lot of people prefer patina………and to satisfy those customers, Navajo bead makers also put an “instant patina” on their beads by adding a satin finish and antiquing on some of their beads such as this gorgeous necklace by Navajo Virginia Tso. If you like shiny, you can use a soft silver polishing cloth. Leaving a little patina in the stamped portions just makes the stamping stand out more dramatically. Very pretty. You can also keep them in an anti tarnish pouch if you want them to stay shiny. How do I clean my Navajo sterling silver and turquoise jewelry? In a word – carefully ! First of all, the cardinal rule is to never allow any cleaner to come in contact with the stones or their settings (the sterling silver bezel that holds the stone in) as the stones may change color (as you’ve experienced) or the settings may loosen. 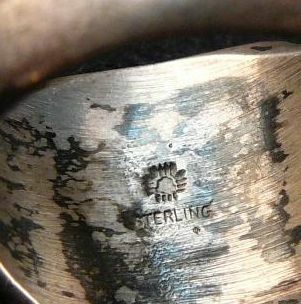 Really the very best way to keep sterling silver shiny is with regular maintenance. Buff with a silver polishing cloth after each use and before you put the jewelry on. Store in anti-tarnish boxes and/or bags. I have a number of articles on this topic here on my blog. This from Blog Reader Tallbear who originally asked me about storage and display. I am sending the two pics showing the display cases. The Squash and Buckles I had purchased some anti-tarnish cloth and took it to the craft shop that was going to frame it for me. I had the shop cover the inside back with that then mount the items on it using stick pins and frame them. It is quite a large wall mounted display. The two watch cuffs and the bracelet, I found a display case for baseballs at a craft store, got one for three baseballs. cut two pieces of Styrofoam (swim noodle) and covered them with the anti-tarnish cloth and put the watch cuffs around them and the bracelet in the middle. Hopefully the anti- tarnish cloth will keep them polished. Any way, hope this will give others some ideas. Thanks so much for the ideas. Please let us know if either or both methods prevent tarnish. This ties in nicely to the last part of my series on storage to prevent tarnish which will come by the weekend. So stay tuned. This is a continuation to Tall Bear’s request for ideas on storage of Native American sterling silver jewelry to protect it and prevent it from tarnishing. I previously showed you the Navajo Pearl tequila chests that hubby made. Here is another idea. There are commercially available jewelry boxes that are lined with anti-tarnish cloth. They come in all sizes from simple ring boxes like the one I show below to full sized chests. Some have see-through lids so you can also use them as display boxes. Part of owning Native American wearable art is to be able to see it even when we aren’t wearing it ! Note that I own mostly pawn rings with patina so my photo example does not show shiny rings. However if you have new rings or want to keep rings shiny, you will have a much easier time if you use one of these boxes. Another method that we use here in the jewelry store it to place strips of 3M anti-tarnish paper inside the bags we use to store our inventory. So you could use the strips in a variety of ways during storage to help prevent tarnish. Anti-Tarnish Strips help keep silver tarnish-free by preventing oxidation because they absorb hydrogen sulfides from the air. They last from a few weeks (if exposed to air) up to a year (if used in a sealed container). We used them with well-sealed zip lock bags. For storing large pieces of jewelry, you can purchase anti-tarnish cloth by the yard and bundle up the items like you do with your silver table ware. Watch for more of my jewelry storage tips coming soon to finish up this topic. What is the best way to store Native American jewerly to keep it from tarnishing? What is the best way to store and or display sterling silver jewelry in order to keep it from getting tarnished? Don’t want to have to keep polishing. This is such a long overdue answer – I’m working my way through all the great questions. Have you read the article I have written on Care of Sterling Silver Native American Jewelry ? I’ve taken some photos of the ways I store my own personal jewelry and will share some of these ideas with you – but these are just to get you started. I hope this will get you started into thinking of things you can do that suit your collection and needs. For Valentines Days a couple of years ago I gave hubby a nice decanter of Corazon tequila that came in a cool wooden box with a neat brass hasp. Well leave it to him to come up with a nifty storage cabinet for my silver beads. He lined the box with anti-tarnish cloth, the type that lines your silverware storage box. Then he mounted four pieces of tubing for hanging the beads and finished each off with a cool marble which not only looks great but keeps the beads from sliding off the end. To allow the box to open without it dragging on the top of the vanity, he attached wooden discs on the bottom – these happen to be wooden wheels from model cars – available at hobby shops. Some of my beads are vintage and have great old patina which I don’t remove but the newer beads stay very shiny in my little vault. In fact, it worked so well, I bought him another bottle of that tequila and voila ! #2 has Indian Head pennies on the end of the rods instead of marble. How cool is this? Watch for more articles featuring my personal jewelry storage solutions…….but I’m going to answer other questions in between…………enjoy !